Vape pod kits have been taking the e-cigarette world by storm as of late, but one that really caught our eye was the IQ Air from Hangsen. Slimmer than any device we’ve seen so far and no bigger than a 15cm ruler, if bulky devices aren’t your preference but you still crave power and great flavour, then this new arrival from Hangsen is sure to tick a few boxes for you. 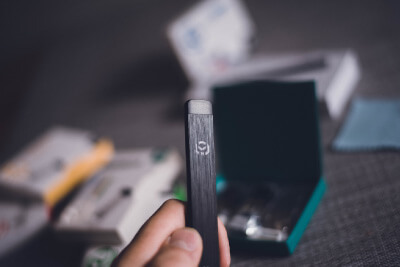 More people seek an e-cigarette that doesn’t weigh down their pocket or their bank balance, pod kits from brands like Juul have become increasingly popular. However, if you’re on the lookout for an alternative to Juul, then the IQ Air could be a contender. With a 200mAh battery and 3.7V to boot, this device is pretty powerful, despite its size. In fact, it actually feels like it has the battery power of a much bigger device. It’s slim, but is deceptively easy to grip and feels comfortable in the hand. This pod kit’s charging system is simple, sleek and fuss-free once you’ve got your head around it (more on that below), and the magnetic charging point means that it slots into place seamlessly. The device and accessories are incredibly smart, with what seems like very little that can go wrong. There are no bits to screw in, there’s nowhere it can leak from, nothing to adjust or replace and the disposable pods make topping up quick and efficient. If you’re a stealth vaper or someone who likes to be discreet, it’s ideal. Ex-smokers will love the fact that it’s inhale activated, which provides a really smooth mouth to lung draw. Also, as the pods contain nicotine salts, the overall experience is much more satisfying than with standard e-liquids, giving you more nicotine per hit, but with less of a harsh throat hit. It also produces plenty of vapour, which is surprising for such a small device. When it comes to battery life, it’s a real winner. Having charged it to full battery, we found that it lasted a couple of days without needing to be charged again, and that’s with all day vaping. While the charging cable is spectacular in terms of ease and the technology wow-factor, it is pretty confusing to get your head around when you first open the product. The IQ Air doesn’t come with a standard plug, so you’ll need to source one of your own or plug it into a laptop or computer. Once you’re good to go, you’ll notice that the USB, although a standard port, doesn’t have the usual metal casing we’re all so used to seeing. This means it can be plugged into a USB plug or port two ways, but of course, only one will actually work. Once you’ve mastered the art of charging this device, we’re sure you’ll have no issues, but to those who are visually impaired, for example, it could be a frustrating product to use. Furthermore, the cable is really short which, although no doubt is positive in terms of increasing the lifespan of it, is a bit of an annoyance when it comes to charging it anywhere except a computer. With it being so lightweight, the chances of misplacing the device are a lot higher (finding it in a bag or rucksack is problematic), and if you were to drop it on the street, you probably wouldn’t even hear it land. There are only three flavours to choose from currently, and while the tobacco and menthol are great, the strawberry flavour is definitely an acquired taste. Each to their own, but it would be great to see some more selection here as the product expands its range. Whether you’re a beginner or an experienced vaper, the IQ Air would suit someone who’s looking for a no-frills way to vape and is craving something a little different from the standard vape pens and box mods. One of the lightest and thinnest devices on the market, the look and feel of the product get top marks from us. Replacing the pods and charging the device is super easy and you can quickly become a master of the art, even if it takes a bit of brain power to begin with. We think this product would be well-suited to former smokers due to the flavour selection, auto-draw feature and size, but even a cloud-chaser could have some fun with this one.